The GALAXY S 5 is an amazing device and OtterBox cases keep it that way through the inevitable drops, bumps and scratches of a mobile lifestyle. FORT COLLINS, Colo., April 8, 2014 /PRNewswire/ -- The Samsung® GALAXY S® 5 seamlessly integrates into everyday life. Get the most out of this cutting edge device with premium protection from OtterBox® Defender Series® and Commuter Series® "Build Your Own" cases, available now. The new sleek and stylish Symmetry Series™ and convenient Commuter Series Wallet GALAXY S 5 cases are also coming soon. "The GALAXY S 5 is an amazing device and OtterBox cases keep it that way through the inevitable drops, bumps and scratches of a mobile lifestyle," said OtterBox CEO Brian Thomas. "We're rolling out a great variety of case designs in time for device launch, which benefits customers who want trusted OtterBox protection to fit their needs and style at the same time they get their phone." Defender Series is the best-selling case in the OtterBox lineup. A built-in screen protector, polycarbonate mid-layer and synthetic rubber slip cover combine to offer durable protection from hard use and random accidents. Essential drop protection, dirt defense and scratch resistance all team up to help keep the GALAXY S 5 looking and performing like new. 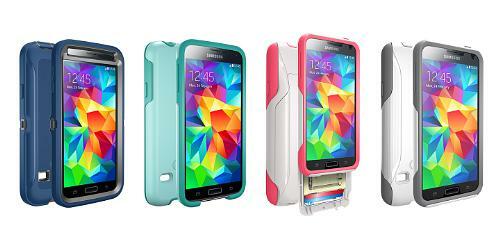 * A wide range of "Build Your Own" color combinations offer rugged styling for the GALAXY S 5. All OtterBox cases allow for full device functionality and the Commuter Series, Commuter Series Wallet and Symmetry Series are compatible with Clearly Protected™ custom-cut screen protectors. For more information, visit otterbox.com. * Defender Series NOT protective against water. Will provide added protection against bump, drop and shock. ** Commuter Series, Commuter Series Wallet and Symmetry Series NOT protective against water. Will provide added protection against bump and shock.